But in the postcard section in one of these stores, they have, among the anti-Bush cards (My favourite: The "Good Terrorist, Bad Terrorist" one with Bush and Bin Laden) is a shitload of pictures of Che Guevara. He seems to have become a hero among the liberal elites; a cult of personality, in a sense. ... Why? How is a man that fought with Fidel Castro and executed thousands of Cuban dissenters, and fought for a standard of government - socialism - that is completely against what liberals stand for... a hero among them? Is anyone thinking about this? Only when it benefits them, apparently. "But he helped the poor!" "What part of 'DISSIDENTS WERE KILLED' doesn't anyone understand!?" This ties into my comment below but liberals/hipsters love communism and socialism because it's particularly anti-US, and supporting it is their way of protesting the US government. Sorry if it's off subject, but just what IS a Libertarian? Ross Perot was one right? And they haven't been around much since then? Pardon my ignorance. As for Perot, he actually founded the Reform Party, and... well, with their opposition of Free Trade, basically, they're against everything the Libertarian Party stands for, basically. XD The most famous victory for the Reform Party would be Jesse Venture winning the race for Govenour of Minnesota. Ventura was a BIG victory. He didn't spend a lot of money, and was the highest office for a third party since the two parties came into being. And if you ask me? From the sounds of it, he was a damn good govenour. Though Lucard could probably say more on that than I can. Ah, really? :O That's interesting. Well, hopefully the Libertarians find success. I can't say I agree with the policies totally, as I would think that not taxing enough will hurt us down the road and we also need SOME welfare, but they will be provide more choices to people so that's good. 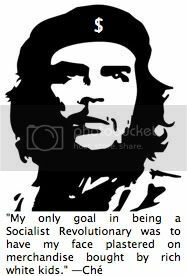 Che Guevara is the second greatest example of viral marketing in modern US culture. (Snakes on a Plane is first.) The image, so cool. Black on a red background. Vague, with sharp lines. He looks kind of cool, like a guy you'd see around the hip part of town. It's just a great iconic image. It doesn't appear to be selling anything; there are no words involved. So that's a big plus too. If I had to guess, I'd say the genesis was something like this. A group of revolutionaries who did admire Che made the image, and the shirts. As they got out on the streets, because of the coolness of the image they got popular. People started asking where to get them, the original manufacturers made and sold more and more. As it got bigger, people began to ask who the guy is. They got the most basic answer: He was a Cuban revolutionary that the US hated. So the crowd that was getting into it (remember I'm talking about an urban/hipster crowd to begin with, the type predisposed to liberal/anti-US thinking) liked the image even more because it became a badge of hipsterism/anti-US political sentiment. Utilitarianism states that that which is mostly beneficial too humanity in the end is morally acceptable, AKA "the ends justify the means". Ergo, a whole bunch of these dickheads look at certain elements of what he was trying to accomplish and decide that he's a hero, because all of the morally wrong-headed things he did are justified. You can blame Zack de la Rocha for a lot of that, I imagine. But then again, you can blame him for a lot of stuff.